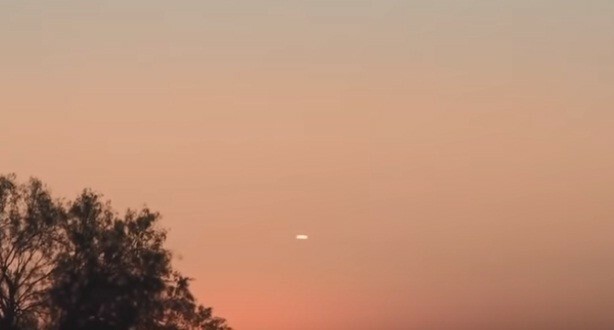 Bright cigar-shaped UFO spotted in Texas skies; Are aliens visiting earth? Popular conspiracy theory YouTube channel 'TexasUFOs' has recently uploaded a strange clip that shows a cigar-shaped UFO hovering in the skies above Texas. The object spotted in the video was too bright and it emanated lights from its body. "Took these photos and video today at sunset. It was the oddest thing I've ever seen. Sorry, the video was so shaky. I was zoomed in really far. I watched it for about 20 minutes. It didn't move. I don't think I've ever seen anything in the sky stay that still before, not even for a few seconds, let alone 20 minutes," says the witness who captured the UFO. The witness also added that the UFO seemed more like a cloud at the first glance. However, when the camera was zoomed in, the witness came to know that the object in the skies had actually a reflecting surface. "It was just so incredibly still. And from a distance, I originally thought it was a cloud but once I zoomed in with my camera lens I noticed it had a more reflective appearance. As I was driving home I called my husband who suggested maybe it was a weather balloon, but once he saw the photos and video he was also stumped," said the witness. The video uploaded by TexasUFOs soon went viral on online spaces, and many people started claiming that this video is an irrefutable proof of alien existence. Viewers of the conspiracy theory channel also put forward various theories explaining this creepy sighting. "Hmm that's really interesting, I've seen something similar a couple times while driving in Conroe TX. Maybe I should start filming it, to be honest, you can really start seeing these ufo's if you just look up to the sky more often, great upload," commented Yessi is Saibot F Flowers, a YouTube user. Another user named Nolberto Cales also claimed that he had witnessed a similar sighting in the mid-1990s. "That is the classic Cigar shaped UFO that I saw in the mid-'90s over Reading PA, thank you for sharing," commented Nolberto Cales. A few days ago, a cluster of unknown lights appeared in the skies of Arizona, and many people believed that it has marked the return of Phoenix lights. As UFO sightings all across the world, especially in the United States, are increasing day by day, many people have started believing that aliens are visiting earth regularly, and some of them even went a step ahead and argued that these extra-terrestrials are now gearing up for an invasion.